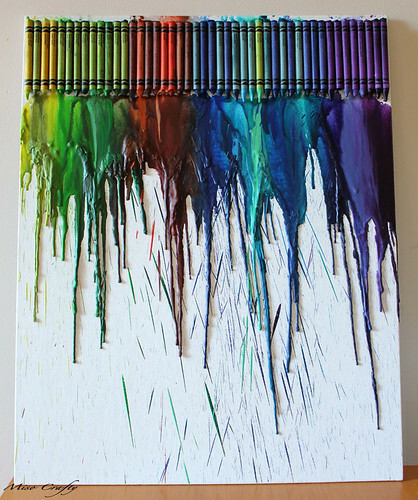 I promise...this is the last crayon melt that you'll see on this here blog. For now. I'm not going to say forever, cause who knows, maybe one day I'll have the urge to do it again for some different occasion. You never know. Anyhoo, this one I did for the Munchkin's bedroom. We decided to keep the original rainbow version in the kitchen. I still wanted new art in the Munchkin's room though, so I decided to dig into the leftover crayons and use up all the colours that are the Munchkin's current bedroom colour schematics - which is blue and green, with dark chocolate brown wood accents. 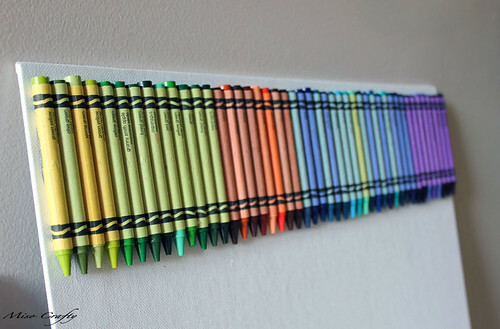 The purple was thrown in there solely because I didn't have that many blue and green crayons and the idea of leaving such white space around the crayons bothered me. I like how it turned out though, I think the dash of purple really adds depth to the entire piece. Again, there's not much to say about this since I've already said what I needed to say in the first and second pieces. I did however, learn from the second and mixed up the air flow settings from high to low from time to time (always with the nozzle attachment on) to get more wax coverage and control over my medium. I hope to get a frame for this too, but for now a light coat of polyurethane will have to do to 'til then. Just hope that I don't change my mind and decide to switch up the art again before I have the chance to frame this!